Options Beef & Cheese Flavor 120ct. Beef & Cheese Flavor 250ct. 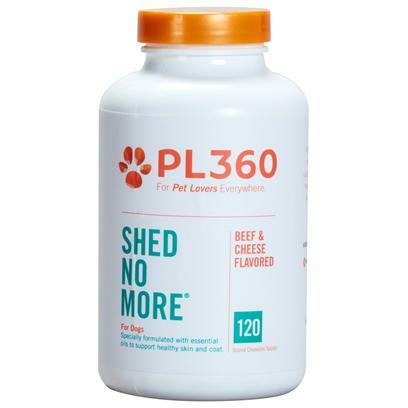 Shed No More contains a special blend of natural oils, herbs, minerals, antioxidants, and vitamins, which can effectively reduce -- and in many cases stop -- nonseasonal dog shedding while providing a healthier & shinier coat. Recommended by veterinarians and breeders alike, Shed No More is the complete formula that will rid you and your companion of unwanted shedding without affecting the normal seasonal dog shedding cycle. Contains fish (cod, menhaden, sardines & anchovy), crustaceans (mollusks), soy. For use in dogs only. In case of accidental overdose, contact your veterinarian right away. If your pet's condition worsens or does not improve, stop product administration right away and consult your veterinarian. *Proprietary Blend - 225mg Soy Lechitin Powder - 150mg Flax Seed Extract - 50mg Choline (Bitaratate) - 2.5mg Copper (Copper Sulfate) - 1.25mg Manganese (Manganese Sulfate) - 1.25mg Zinc (Zinc Oxide) - 1.25mg Niacinamide - 1.25mg Inositol - 1.25mg Vitamin A (Retinyl Palmitate) - 125IU Vitamin D (Cholecalciferol) - 12.5IU Vitamin E (DL-Alpha Tocopheryl Acetate) - 1.25IU Thiamine - 0.125mg Riboflavin - 0.125mg Vitamin B-6 (Pyridoxine HCL) - 0.125mg Selenium (Amino Acid Chelate) - 2mcg Vitamin B-12 (Cyanocobalamin) - 2mcg *A powder complex of safflower oil powder, sunflower oil powder, borage oil powder, evening primrose oil powder, fish oil powder, flaxseed powder. Beef flavor powder, brewers yeast powder, cheddar cheese flavor, liver powder, magnesium stearate, cellulose, silicon dioxide, thiamine mononitrate. Shed No More should be administered daily and swallowed whole or broken up and stirred into food. Dosage is dependent on your pet’s weight. It is recommended that this medication be built up over a 10-14 day period.